Thanks to all who entered this giveaway. It is now closed. 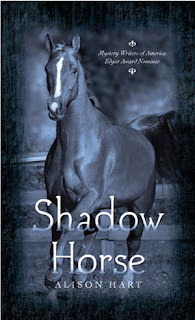 Recently I was contacted by Alison Hart, who asked if I'd be interested in reviewing her books Shadow Horse and Whirlwind, and offering a giveaway. I was thrilled she thought of me, and I confessed that I still have a huge collection of horse books from when I was a kid (three shelves worth, in fact). Alison lives in Virginia and is the author of more than sixty children's books. You can check out her website HERE. Shadow Horse opens with the main character, Jasmine (Jas) finding herself in deep trouble. Her grandfather has had a stroke, and her beloved horse Whirlwind is dead. All of this is directly related to the wealthy but evil-hearted Hugh Robicheaux, whom Jas assaulted with a hoof pick, landing herself in the court system. At the hearing, she receives 45 days of probation and is placed in foster care, since she doesn't have a relative to go home to. Jas finds herself placed at the run-down animal rescue, Second Chance Farm. Her grandfather is in a nursing home, and she fears for his recovery. Ms. Hahn, the foster mother, seems nice enough, but when Jas sees a picture of her with Hugh Robicheaux, she knows she can't be trusted. She is very much alone, in spite of some other kids her age - Chase and Lucy - who could be potential friends. When Jas rides along to a horse auction, she sees a horse with a rare thyroid problem. His condition is completely debilitated, but Jas sees through the bones and sagging head to an underlying strong conformation and power. She talks Ms. Hahn into purchasing the animal, and they bring home her Shadow Horse. Mr. Danvers, the vet, confirms Jas's suspicions and with treatment for the thyroid problem Shadow makes a strong recovery. So strong, in fact, that in no time he's jumping out of pasture fences. And then Jas realizes that there is something more to this horse. He reminds her of another horse that previously belonged to Hugh Robicheaux, long deceased, named Aladdin. How will Jas link Aladdin to Whirlwind? And what will happen when she returns to court? Will her grandfather recover? And what about all these threats that Mr. Robicheaux keeps making? Shadow Horse will leave you wanting to know more! Whirlwind opens by summarizing what happened in Shadow Horse. There is a case against Hugh Robicheaux for insurance fraud - that he killed a 'ringer' horse for Aladdin and sold the real Aladdin overseas for big money (plus collected on insurance). But how can they prove that Shadow is the real Aladdin? And will Jas be able to get released from probation and live with her grandfather again (who is currently in a nursing home)? At her 45 day court hearing, Jas has the support of her grandfather, Miss Hahn, Chase, and Mr. Danvers. But Hugh Robicheaux corners her alone and threatens to release a surveillance tape that shows her and Chase breaking into the office of his stables. He also threatens to harm Second Chance Farm if Jas doesn't stop searching for Whirlwind. How does Hugh know that Jas is searching for Whirlwind? He must have a spy somewhere on Second Chance Farm - is it Mr. Muggins, a volunteer whose wife died of cancer, or is it ex-rodeo rider Rand? Jas decides that she has no choice but to stop looking for Whirlwind to keep the farm safe. A house trailer is moved to Second Chance Farm for Jas and her grandfather. Moldy and in shambles, Jas begins to fix it up to be home. Meanwhile, she can't resist continuing to search for Whirlwind. She begins calling around to try to find the person who hauled Whirlwind away. Marietta Baylor, a chameleon of an insurance investigator, moves in to help search for Whirlwind. Meanwhile, donations are down at Second Chance Farm and the cost of hay is up. They only have one month of operating budget left. Is Mr. Robicheaux behind this? And when someone winds up dead, how will they prove that Mr. Robicheaux is connected? The end of Whirlwind will sweep you along with plenty of intrigue, a budding romance between Jas and Chase, and a cross-country chase that culminates with a surging hurricane, electricity and security system outages, and of course, the attempted vengence of Hugh Robicheaux. I had so much fun reading these two books, and I know you would too! I loved all the horse-world details, and I also felt strong connections to the main character, Jas, because of all my time spent working juvenile probation. I met many kids just like Jas. 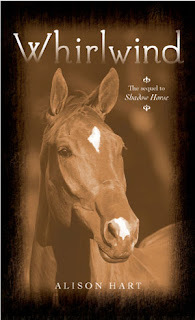 Would you like to win a copy of both Shadow Horse and Whirlwind? Just leave a comment to enter, and if your email is not attached to your profile, please include your email address in the comments. This giveaway is limited to U.S. residents only. Giveaway ends at noon March 27th, when a winner will be chosen by Random.org and the winner has 48 hours to respond. I don't know why I am entering. I never win your giveaways. But I want to read both these books. Could you loan them to me? Thanks for a wonderful review, Lisa! I have no idea how you fit both books in to your busy life. I hope Whirlwind and Shadow Horse got you itchin' to ride again. I'm a sucker for juvenille fiction (and a wanna-be writer). You have my e-mail, right? Wow! It is quite a testament to your writing and good judgement to be asked to review books!! And you did a very good job! I can't believe you had the time with your busy life. I will not enter this one, just because I am very backed up in my reading and people keep loaning me books that I haven't asked for, don't know why! But you make them sound so good!! I'm now wondering how close we live to each other. We live in Waynesboro, about an hour and twenty minutes from Roanoke. We come there once in a while to go to Taubman Museum and to take my friend to see her daughter. Sounds like really interesting books; would love to read them in my spare time. Great overview/reviews! My email is tmeites@gmail.com. Those don't sound like kids books to me. I think they sound very interesting. I will be checking out her website. I will put My comment in for the give away. I have a 14 yr old grand daughter who reeds alot and her comprehenson is far beyond her age. If you think these books would be good for her count me in. She loves animals especialy dogs and cats. She has 2 cats and 3 dogs, and seems to care for them alot. Her mother left Her and Her 2 older brothers and their father about 4 years ago and doe's not show alot of interest in them any more. I haven't read either of those books - they sound good. And I would love to enter your contest. We love books! I have a hard time keeping my daughter stocked with enough to keep her occupied. This must be my lucky day. Not for the give-away, but for the contents of the post. I loved your reviews of these two books. They remind me so much of my own childhood. I read horse stories all the time as a child. I have ridden and owned horses off and on all of my life. My daughter competed in show jumping and I tagged along, loving the mom's role of groomer, horse grazer, and cheerleader. I would love to have a copy of these books to read and discuss with Emily. She is starting to read for pleasure now and we have wonderful dicussions about books we've read together. Please enter me into your giveaway. Hi there. I'm a horse loving knitter(Rav ID-Stuckinillinois) who was referred from Ravelry from Rav. member-catinblack. My 2 kids and I love riding and being around horses and would love to enter your contest! Thanks so much! Oh ratz, I'm such a hen head this evening! My horse decided she didn't want to deal with me today and almost bucked me off on a steep downhill trail, and I'm more than a bit discombobulated right now! I'm Soozletew on Ravelry, saw the giveaway mentioned in catinblack's post today. Whew! Got it all in at last. Sorry to be a pill. They sort of sound like Black Stallion books for adults. I didn't know there was a horse fiction genre. I would probably love them. I have to enjoy horses vicariously. Catinblack sent me here, I'm a long time friend of hers and a yarn dyer. She is having people from Ravelry come to read your blog - it's a very nice blog, I like the typefaces and photos. For the last several years, I've read more young adult fiction than the adult fiction. I mean, who doesn't love Potter, Twilight and all of the others? :) I, too, was referred over by Catinblack on Ravelry. Nice blog! Saw this from catinblack on Ravelry. Loved all Walter Farley's as a kid, have read Black Beauty probably 1000 times, Marguerite Henry's books with the beautiful illustrations. Your review of these 2 will send me out to buy (unless I am lucky enough to win). Nancy at gnc620@yahoo.com Thanks. Love your writing style. I was referred here by JDaniel4's Mom. She gave you quite a review! Count me in too Lisa! I love a good giveaway! Both books sound very interesting! Saw this on Ravelry (twelfth-night on Rav) from catinblack. Like the poster above, I grew up reading Marguerite Henry and Black Beauty, so my initial response was something to the effect of OMG HORSES! and OMG BOOKS! I'm a geeky thing. That's okay, though. Pick me, pick me. Would love to meet you someday, Lisa. I'm your mom's friend, Debbie. She knows where to reach me or my email is dabrame@aolcom. Lovely giveaway! Thanks. I saw your Mom (cathinblack)'s post on Ravelry. I love to read. I will read young adult as well as adult, especially a good horse book. I still have all my horse books for junior high and high school. I have collected all the Walter Farley books and many others. Because of my love for reading, both my daughters love to read as well. Look like great books! I have one whole book case dedicated to horse books. :) Love those things! Love to read, love horses, love mysteries... what a great combo. Count me in! Thanks for the chance to win again! We are eagerly looking forward to Alison Hart's author visit. Please enter our elementary library in your drawing contest. As the owner of two elderly mares, a horse-lover since I was a kid, and the author of a just-published middle grade novel that has horses in it, I'd love to read these two horse books!